About 30km northwest of Santorini, Folengandros (accent on the "len-" FoLENgandros) is another one of those undiscovered Aegean gems. Although it is a lesser-visited island in the Cyclades, this place of about 800 year-round residents has an unusual topography. There is a peaceful beauty about this lightly-populated, lightly-visited island. 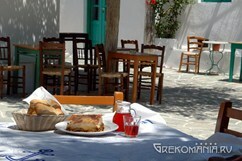 Many year-round residents live in one of two villages: either Ano Meria, pop. 300, which is the more traditionally-styled village, or Hora (Folengandros Town), pop 325, which sits, like an eagle’s nest, at the top of a dramatic, 200m-high cliff face. The island’s coastline has been carved by wind and water into many small bays, coves and inlets, and the beaches are excellent. It’s a rocky, mountainous island with several peaks in the 300-400 range. Over the centuries farmers have terraced the hillsides, building dry-stack retaining walls to level the ground and prevent erosion. There are few sources of water, and the island depends upon cisterns and catchment tanks which store up the winter rains for the parched summer months. 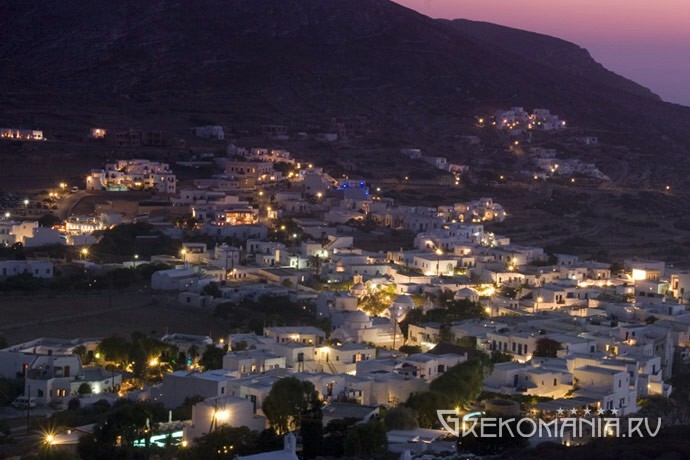 Tradition says that the first settlers in Folengandros were shepherds from western Greece. Because these shepherds were men, an early name for the island was “Polyandros (“Many Men”)." The island was subsequently settled, they say, by the Cretan Minoans, under the leadership of the son of the Cretan king Folengandro. It eventually became a place of refuge for men who were wanted for various crimes in Crete. Another version of the island’s name is that it came from the Phoenicians, who had established a trading center and naval base there around 1,000 BC, from which they launched out to various islands all over the Aegean. The name comes from the Phoenician for “rocky ground.” It was also known as “iron ground” because of the difficulties involved in cultivation. Later, Dorians from Santorini took Folengandros and settled there. By 425 BC it had fallen under the rule of Athens, which charged an annual tax of 2,000 drachmas (a drachma was a day’s wages for a laborer.). When the Romans showed up a few hundred years later, they used Folengandros as a place of exile. After passing under the authority of the Byzantines, Franks, and Venetians, Folengandros was taken and held by Turkish pirates in the mid-1500’s, until 1617, when it became part of the Ottoman Empire. In 1821, Folengandros rebelled, with the rest of Greece, against Turkish rule, and became part of the new Greek kingdom after the war ended in 1832. The small port village of Karavostassis receives ferry traffic from the nearby islands of Milos, Sifnos, Mykonos, Naxos and Santorini, usually by way of Athens. In the off season connections to Athens only come a couple times a week. Karvostassis's waterfront sports a combination of fishing boats, yachts, and the occasional large ferry. 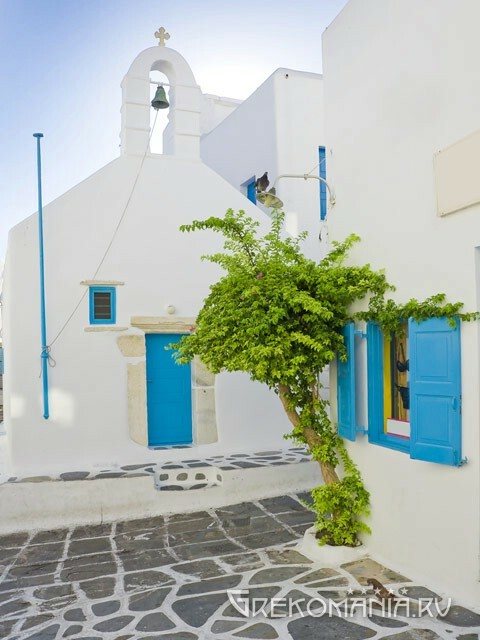 The little fishing village itself is characteristically Cycladic in its architecture- buildings the shape and color of sugar cubes, blue trim, narrow byways dripping with bougainvillea as a scarlet counterpoint. The cave of Georgitsis is near the beach of Livadi, about 1.5km down the coast, near the islet of Agios Ioannis. It's a sea cave and you need snorkeling gear to visit it. It has a lot of colorful sea marine life near the entrance, including anemones, coral, sponges, hermit crabs, and slipper lobsters. The water in the cave is a deep, neon blue. 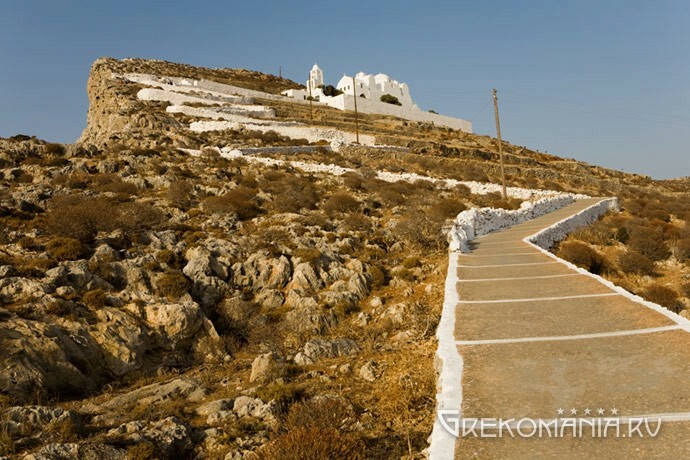 About 3km northwest of Karavostassis, along one of the island's only paved roads, is Hora, the town on the cliff. 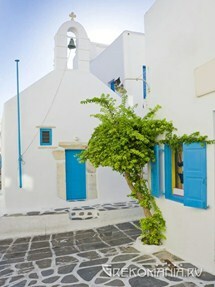 About halfway to Hora is the tight, sparkling white, little barrel-domed chapel of Saints Rafael, Nikolaos and Irini. That's 3 saints for the price of one. The chapel is kept in immaculate condition, and it's bordered by a low, whitewashed wall with a blue picket gate. 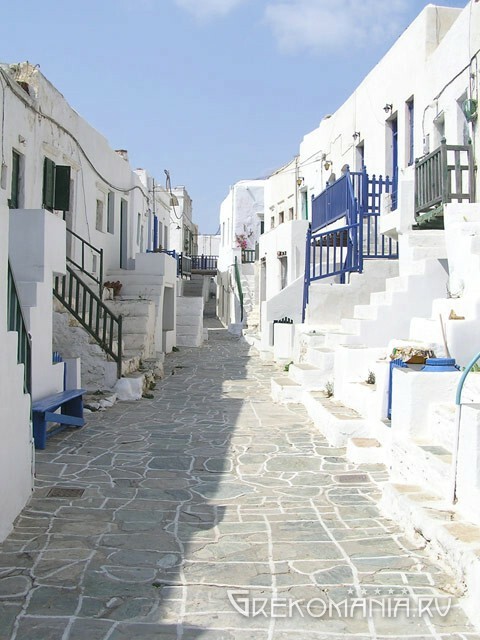 Hora (Folengandros Town) is a very interesting village for at least 2 reasons: its location, and the way it's configured. As far as location, it sits right on the lip of a sheer cliff, 200m above the broken rock at its base, and the sea, which just a couple hundred meters to the north. It's a highly defensible location, unless, of course the village were attacked from its eastern side, in which case the defenders would have no place to go except over the cliff if the enemy penetrated the town. At any rate the view is spectacular, and has been compared favorably to Santorini. The other interesting thing about the village is the sort of "village within a village," an oblong section of buildings right at the edge of the cliff built with connecting walls like row houses, forming the "Castro," essentially a walled citadel. The concept is medieval, and as such it's one of the oldest medieval towns in the Cyclades. There are little hand-made signs here and there pointing your way to the Castro. Another interesting feature of Hora is its 3 linked, tree-shaded squares. Exploring the narrow, pedestrianised lanes of Hora, looking out over the city walls to the misty distances of the Aegean, relaxing in the shade of one of its squares with a coffee and something to snack on, or sitting down to a sumptuous al fresco evening meal, makes for one of those kinds of days you don't forget for a long time. You can walk the 400m (in a straight line) distance and 100m climb up the twisting, switch-backed, wide, concrete aggregate path running along the cliff face up to the church of the Assumption of the Panagia. In an attempt, one supposes, at a rustic safety fence, the path is lined with waist-high, whitewashed boulders which prevents people wandering around near the edge of the precipice. Figure about 15 minutes. This best-known church on the island commands a commanding location which affords unobstructed views of the entire island and the sea which surrounds it. There's some speculation that it was build on the ruins of an ancient temple (a common enough occurrence) because some the church's building material is marble obviously much older than the building itself, date of completion not known. It was renovated in 1687, though. It's a beautiful white building with several domes, and a Venetian-style, multi-arched bell tower. Once serving as the catholikon of a nunnery, the church has some fine frescoes, a marble iconostasis, a marble throne, and a silver-embossed icon of the Virgin Mary that is said to have miraculous properties. The most dramatic story connected with the icon involves 18 dozen pirate ships making their way to a landing below Hora. The villagers fled to the church, and prayed to Mary for a miracle. A strong north wind sprang up, dashing the ships on the rocky shoreline and taking the lives of every pirate. After that the island adopted Mary as their guardian saint. About 5km northwest of Hora, following the main road which bisects this relatively long, narrow island, is the village of Ano Meria. This small settlement's main point of interest is the Laographic (Folklore) Museum, which gives visitors 3-dimensional examples of life on the island in years' past, especially its agricultural practices. On the northeast shoreline of Folengandros at a height of about 30m and overlooking the sea is the Chyrsospilia (Gold Cave). This fascinating, 300m-deep, double-chambered cave, which was likely a place of worship, had some Roman-era wells, but it's biggest draw are the names covering its walls, some dating from as long ago as the 4th century, BC. For centuries Greeks, some of them known to us, from all have been leaving their names on its walls. There are over 400 male names, and far fewer female names. The theory is that perhaps this place had a role in coming of age ceremonies for the young people who visited it. 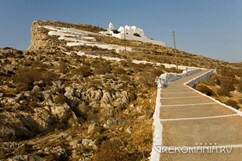 The ancient steps carved into the stone from the cliff edge are called the Hellenic Steps. You can also get to it from the sea, by boat. This is not an easy place to get to, especially on a windy day. At any rate, the cave is currently (2016) closed while archeological work goes on. The beaches of this western Cycladic island placed 9th on the 2016 list of the 10 Hottest (as in "sexiest" Beaches Worldwide by the British TV station “Travel Channel.” The beaches of Folengandros are by and large scenic, peaceful, and beautiful. Agali, 5km west of Hora, is a nice, sandy, partly organized beach hemmed in by cliffs and featuring sun beds, umbrellas, and water sports. Close to the port of Karavostassis is the village beach, with its warm, shallow, family-friendly waters. Tamarisk trees provide shade. Other beaches, such as Agios Georgios, Ambeli, and Ligaria, all about 8km northwest of Hora, towards the northwest end of the island, are more secluded and less organized. Livadi, a nice, sandy beach, offers opportunities to camp, although on an island this sparsely populated, some people just pitch their little 2-man tents and hang out for awhile. Livadi has all the amenities you'd want, including a restaurant, a mini market, a communal kitchen and washing machines. It even offers apartments for those who want a little more comfort.